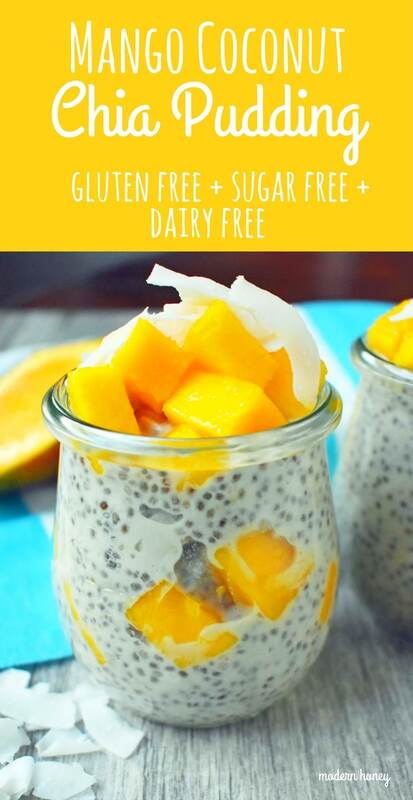 Mango Coconut Chia Pudding is a dairy-free, gluten-free, sugar-free, healthy dessert made with fiber rich chia seeds, rich coconut milk, maple syrup, coconut and fresh mango. I love perusing the aisles of Whole Foods and drooling over the healthy beautiful foods. 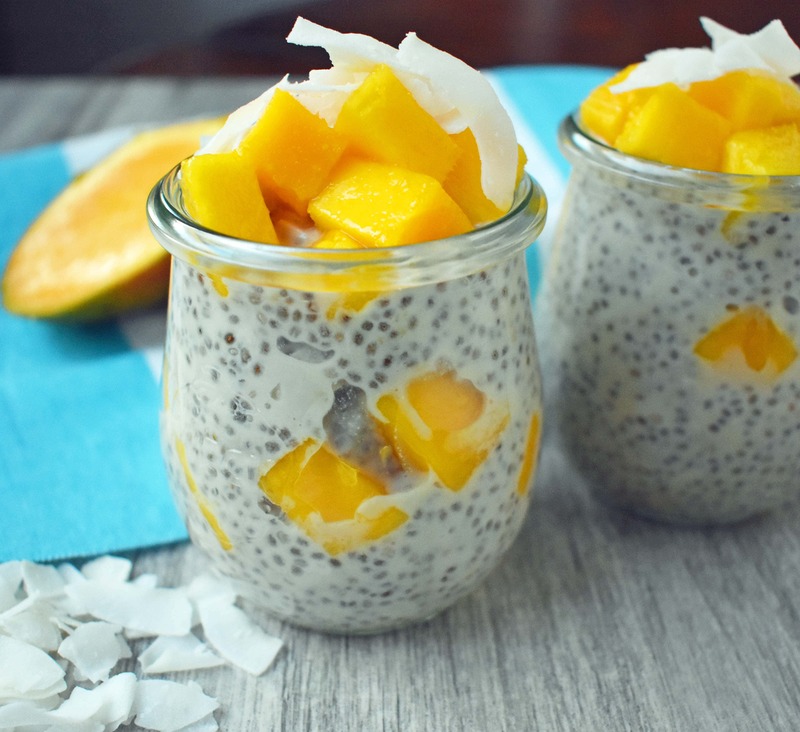 One of my favorite things is their coconut milk chia pudding….except the hefty price tag! It’s $6 per serving so it can add up quickly. I went home to figure out how to enjoy it at home for a fraction of the price. 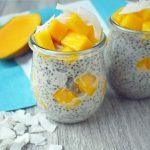 This Mango Coconut Chia Pudding tastes even better than the Whole Foods chia pudding, checks all of the boxes and is oh so good. The beauty of this dessert is that you eat it with zero guilt. Chia seeds are naturally high in Omega-3’s and fiber, which keeps you full and satisfied longer. Coconut Milk from the can adds a creamy richness to the pudding. Real maple syrup is used which adds a natural sweetness. A touch of vanilla gives it a warm rich flavor. Unsweetened coconut flakes are mixed into to create texture and the pudding is topped with fresh mango for tropical sweetness. The key to making homemade chia pudding is to refrigerate it for at least 4 hours to give the chia seeds time to expand and soak in all of the coconut milk. The chia seeds turn from hard seeds into a soft, creamy, melt-in-your-mouth pudding. You can make this in the evening and refrigerate it overnight and eat it as a healthy breakfast, snack, or dessert throughout the day. When I am eating healthy, this is my go-to snack because it curbs my cravings for sweets and has so many health benefits as well. 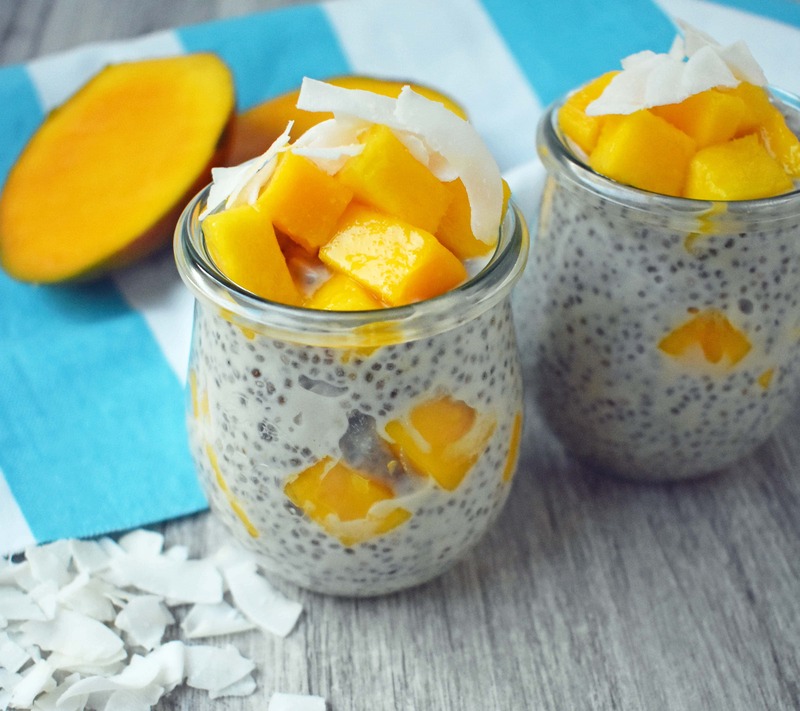 It works best to add the fresh mango slices when you are ready to serve the mango coconut chia pudding. It can be layered into jars or placed into a small bowl. Top with unsweetened coconut flakes and fresh mango slices for a tropical treat. A gluten-free, dairy-free, sugar-free dessert that is healthy and delicious! Whisk chia seeds, coconut milk, maple syrup, vanilla, sea salt, and coconut flakes together in a bowl, Stir well. Cover bowl with plastic wrap and let chill in refrigerator for at least 4 hours or overnight. 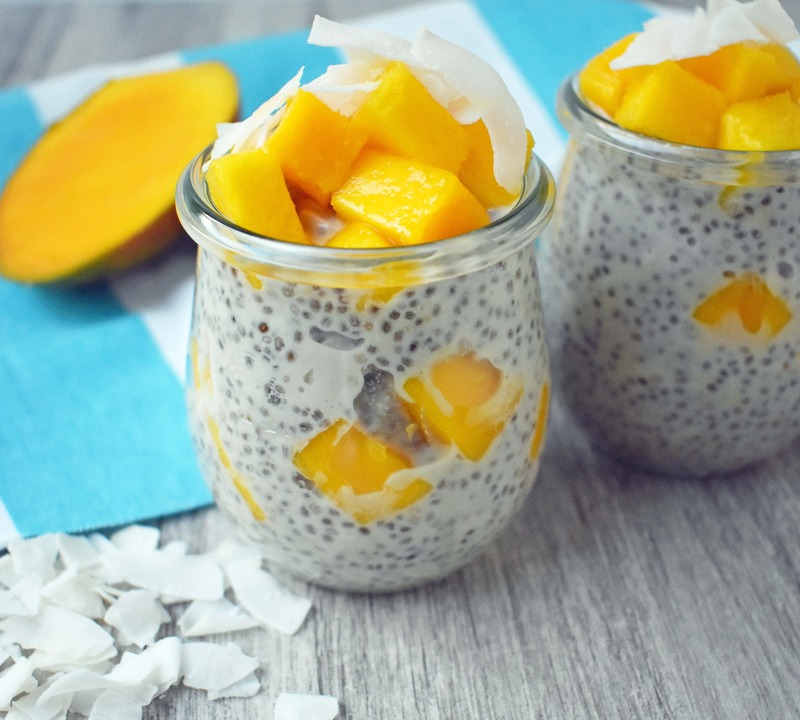 Once the chia seeds have expanded and softened, stir and top with fresh mango.